What can Russia offer to the West? Professor of Russian and European politics at the University of Kent talks about Russia's role on the international stage. Despite President Vladimir Putin’s attempts from the very first days of his leadership to “normalise” relations between Russia and the West, relations remain fundamentally abnormal. Putin’s definition of normality was straightforward: that Russia would no longer be treated as a special case but as just another sovereign and independent country. To this end, at the first opportunity, he paid off the bulk of sovereign debt and ended various dependencies that had built up in the 1990s, for example on the IMF. At the same time, he accelerated the integration dynamics that had languished in the Yeltsin years. This included intensified relations with the European Union and, after 9/11, the attempt to create a partnership of equals with the United States. However, it soon became clear that this “normalisation” strategy would not work. Russia was unable to become just another great power. The political demands placed on the country are high, in part because Russia itself accepted these demands as part of the process of becoming a nation state in 1991, and in part because of its self-identification as a European state and a core member of the international community of nations. The systemic and identity contradictions that remain unresolved in Russia mean that “abnormal” features will remain in Russia’s relations with the western world for the foreseeable future. The language of boycotts and threats by western powers and activists only exacerbate the contradictions of the Russian polity rather than helping resolve them. Russia’s acceptance into the transatlantic community was problematic from the very beginning, hence President Boris Yeltsin’s talk of a “cold peace” as early as December 1994. One of the features of this cold peace syndrome is the absurd language of resets and pauses. No normal countries would talk to each other in these terms, and it is humiliating for all parties to have degenerated to the point that they do so now. Such language is a measure of how far there is to go until normal relations can be established. It is time for a more mature relationship to be established on both sides. For the West, despite much talk about Russia’s relative marginality and insignificance, a strong relationship with Russia is essential for strategic, economic and simple diplomatic reasons. Although plenty of American senators and civil society activists seek to drag themselves from obscurity by bashing Russia – and there is always political mileage to be made out of that activity - that sort of politics is sterile and dangerous. The tragedy of recent years is that the EU has not been able to develop a distinctive voice of its own as one of the fundamental representatives of the European nations and as a mediator in transforming the transatlantic community. While Europe does have a voice of its own, its failure to challenge the mistakes of the dominant power in the western hegemony over a whole set of issues, including the war in Iraq, has undermined its credibility as a normative power in its entirety. Of course, this allows Russia to rise to the occasion, and instead of reinforcing the marginality that its opponents wish to impose on the country, Russia can intervene in a positive manner to help resolve some of the impasses of the West’s own making. Supine subservience of the British type to American hegemony helps no one. It is the duty of a friend to point out the errors of one’s friends. Thus, Russia can reposition itself from a perceived trouble-maker to problem-solver. 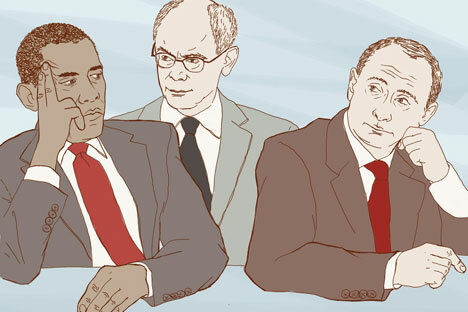 Both Barack Obama and Putin understand that there is no fundamental ideological divide between Russia and the West, hence talk of a new Cold War is misplaced. Yet tensions do exist that foster the atmosphere of the cold peace. From Syria to Snowden, there is no end of issues where Russia has its own views. Even though a whistle-blower is naturally not to Putin’s taste, Russia was right on normative grounds to offer him asylum, if only for a year. Equally, Russia’s analysis of the Syrian crisis from the very beginning has been more accurate than that of the western powers. The fundamental question is whether these are normal differences of view or whether they indicate an incompatibility of strategic interests. There is little evidence of the latter. Even the West’s blunt attempts to foster the geopolitical disintegration of Eurasian space cannot be taken as a reflection of a fundamental conflict. That is simply what the western imperial powers have always done, and will continue to do until the West itself can move to a genuine “post-modern”form of international politics. The dressing up of traditional imperial ambitions in the garb of the advance of democratic governance convinces very few. The main source of Russia’s influence today is to act as a moderating force in international politics. The West has got itself into quite a few pickles and Russia can act as the broker to alleviate some of these conflicts and contradictions of western policy.